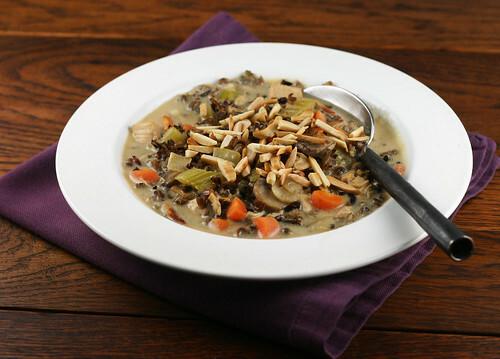 Deeply woodsy and autumnal in richness, this soup is a wonderful meal in itself, with the crunch of toasted almonds and the chewy bite of wild rice. Growing up in Minnesota, I remember, Patty making this soup on the coldest of cold winter nights – a real treat to behold! This is going to keep you full and toasty on those nasty days that often stretch into eternity! Bring to a boil then turn down heat and simmer for 45 minutes. until smooth and lightly browned. DO NOT BOIL or it will separate. This looks so good! I love wild rice. Soups usually have all the same texture to them and get a little boring after a while. I love soup with different textures and this one looks to have them all! 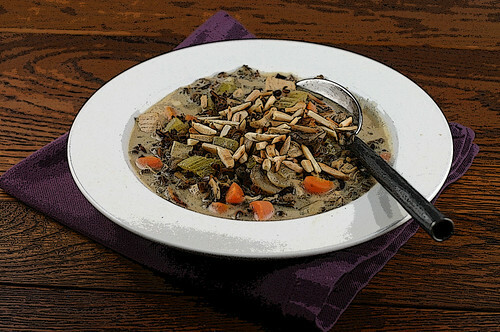 Mary wild rice makes for a great soup, as your photos so beautifully display. This looks so homey and warming, perfect for a snowy afternoon! Such a rich and delicious soup! I would love the crunch of toasted almonds! How we LOVED this soup! Brings back tons of memories! Great post and pictures, Mary! I think the toasted almonds are a sublime touch! Ooh, I’ve seen shows about how the American Indians in Minnesota go out and whack the wild rice to collect it and bring it home to make soups and brews like this one. Looks great and very healthful!